CLEARFIELD – A debate over precinct boundaries in Bradford Township has been resolved. Commissioner John Sobel made the announcement during a special meeting of the Clearfield County Board of Elections on Tuesday. According to him, a hearing was held in the matter before President Judge Fredric Ammerman on Jan. 9 in the county Court of Common Pleas’ Civil Division. Sobel said on Feb. 13, Ammerman ordered that the two Bradford Township voting precincts be re-divided based upon the map and boundaries proposed by the township’s petitioners. 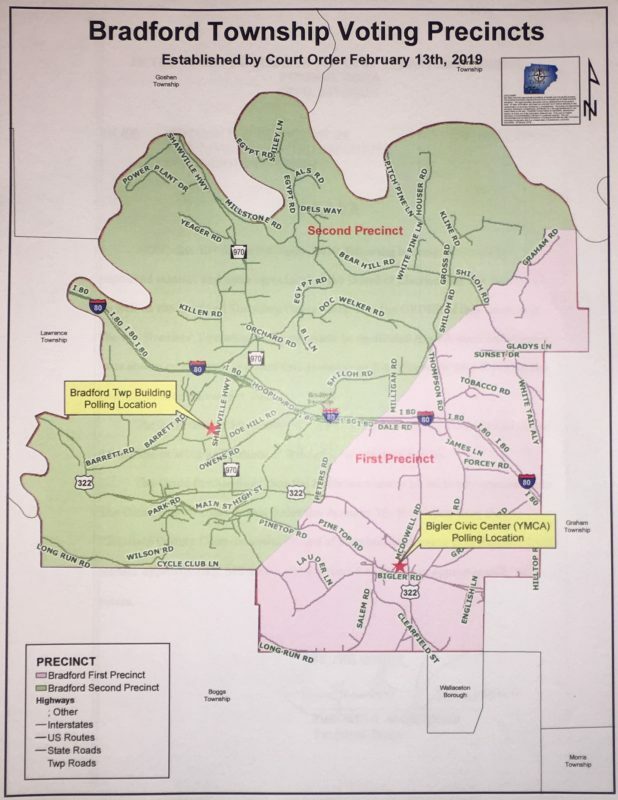 Under the new map and boundaries, Sobel said Bradford First will have approximately 666 voters and Bradford Second will have approximately 1,011 voters, all of which are permissible. Sobel said though this process was long and bumpy, it was proof that Clearfield County Government did work, and all sides worked together to reach the final resolution. He expressed his thanks and compliments to the supervisors and citizens of Bradford Township, GIS Director John Kaskan, County Solicitor Kim Kesner, township Solicitor C.J. Zwick and the court. “The citizens and supervisors brought their protest to the Board of Election coming up on a year ago,” Commissioner Mark McCracken said. “… They worked to put a new boundary in place and presented it to the court. After the map was accepted by the board, Solicitor Kim Kesner strongly recommended the Elections Office speak with the Pennsylvania Department of State. He didn’t believe the DOS had any authority to reject the new map but said it had previously requested a copy of the new map for purposes of a review. He said the DOS was contacted and requested to take part in the Jan. 9 hearing in this matter, but the department didn’t send a representative. Kesner said it would be at the Elections Office’s discretion so far as when to implement the re-division and notify voters, but reiterated it was best to contact the DOS first. Below are the legal descriptions provided by the Board of Elections of Bradford Township’s voting precinct boundaries under the re-division. It starts at a point on the West Branch of the Susquehanna River where the Bradford and Graham township lines intersect, then south along the Bradford Township line to a point where the Bradford and Graham townships and Wallaceton Borough lines meet. From there, it follows west and north along the Bradford Township line to its intersection with Millinder Lane, then northeast along Millinder Lane to its intersection with Mutton Hollow Road, then northeast to the intersection with Pinetop Road and Lumadue Lane. It continues north along Lumadue Lane to its end and northeast to the end of Turner Road before going east and then north along Turner Road to its intersection with U.S. Route 322 and Peters Road. It follows northeast along Peters Road to its end, then northeast to the intersection of Geynets Lane and Dale Road, and then northeast to the intersection of Shiloh and Thompson roads. From there, it continues northeast to the end of Buckskin Drive, then northeast along Buckskin Drive to its intersection with Shiloh and Graham roads, and then northeast along Graham Road to its intersection with Lookout Lane. It follows northeast along Lookout Lane to its end, then directly east to the point of the West Branch of the Susquehanna River back where the Bradford and Graham township lines intersect, or the starting point. It starts at a point on the West Branch of the Susquehanna River where the Bradford and Graham township lines intersect, then directly west to the end of Lookout Lane, then southwest along Lookout Lane to its intersection with Graham Road and then west and south along Graham Road to its intersection with Shiloh Road and Buckskin Drive. From there, it follows southwest along Buckskin Drive to its end, then southwest to its intersection of Shiloh and Thompson roads, then southwest to the intersection of Dale Road and Geynets Lane, then southwest to the end of Peters Road, and then southwest along Peters Road to its intersection with U.S. Route 322 and Turner Road. It continues south and west along Turner Road to its end, then southwest to the end of Lumadue Lane, then south along Lumadue Lane to its intersection with Pinetop Road, then southwest to the intersection with Mutton Hollow Road and Millinder Lane. From there, it goes southwest along Millinder Lane to its intersection with the Bradford Township line, then west and north along the Bradford Township line to the West Branch of the Susquehanna River. It then follows northeast with the meanders of the West Branch of the Susquehanna River where the Bradford and Graham township lines intersect, or the starting point. Elementary School Burglarized in Fox Twp.